On your way from Lima to Huaraz, you will bring a visit to Caral. 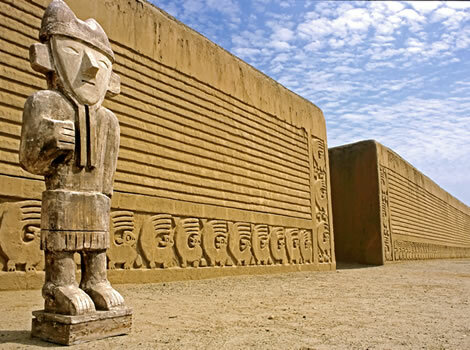 This archeological site of about 5000 years old is considerate to be the oldest of Peru. Then the road ascents into the Andes Mountain Range until you reach Huaraz. In the morning you will first bring a visit to the local museum of Leymebamba. This museum shows a colleccion, with more than a 1000 objects and 200 mummyâ€™s that were partly found in Laguna de los condores. On the way to Chachapoyas you will visit the tombs of Revash. These tombs are cut out of the rock wall and painted with typical motives from the Chachapoyas. The tour of today goes to the Gocta Waterfall, surrounded by cloud forest. With a height of 771 m this is the third highest waterfall in the world. 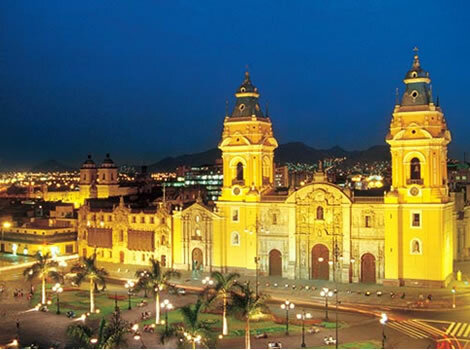 After arriving in Chiclayo you will be brought to your hotel to have an early check-in. Todayâ€™s tour start with a visit to Huaca Rajada, the original tomb of the Lord of Sipan. Today you visit the Museum of Sican. This museum shows a great collection with (golden) objects which were found in Bosque Pomac. Next visit is to the well-known Bruning Museum. This museum includes a very complete collection about the history of the surroundings of Lambayeque. 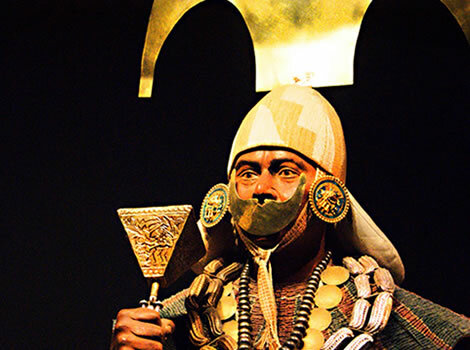 For example: detailed textile and ceramics from the Chimu and Vicus culture; ceramics + golden objects and jewelry from the Mochica and Chimu culture + several other objects from the Lambayeque, Moche, Chavin and even Inca culture. After the tour, at an appropriate hour, we bring you to the airport or bus terminal. This tour starts with visiting Carhuaz, known for its great ice-cream. Then you continue to Laguna Llanganuco. This brightly colored lake is surrounded by snowcapped mountains and trees from a fairytale story. From Huaraz it is a very scenic route through the Andes towards ChavÃ­n de Huantar with views over snowcapped mountains and the attractive Querococha lake! The archeological site of ChavÃ­n consists of temples, subterranean galleries and sunken squares and was constructed about 800 B.C. to honor the Gods of the local civilization. One of the main attractions is called â€˜El Lanzonâ€™ a huge sculpture of about 4 m high, in the shape of a knife. Other interesting signs include the â€œLa pared de las Cabezas Clavasâ€ or â€œthe wall of the Key Headsâ€. 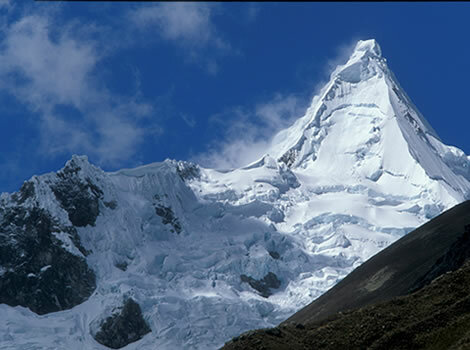 Today you travel through the amazing Cordilleras Blanca (White Mountain Ranges) to the coast of Trujillo. On your way you will visit the archeological site of Sechin. 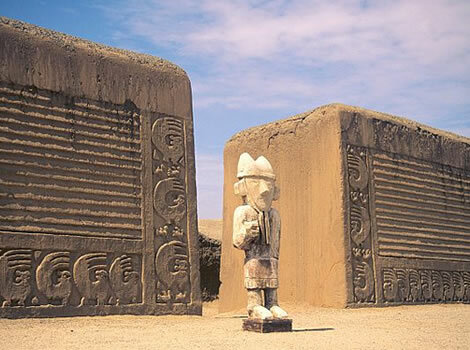 Sechin is one of the oldest astronomical and religious complexes of Peru. It is also the first place in Peru that suggests human sacrifices on a stone facade together with suggestive motifs of warriors in procession. The museum on site shows the drawings of their gods. 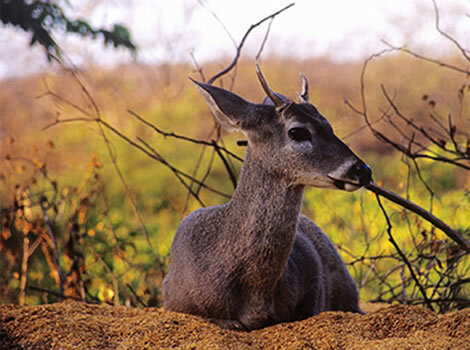 A scenic journey (6h) brings you from the desert of Trujillo, to the countryside of Cajamarca. Upon arriving in Cajamarca you will have time to visit the bathing complex of BaÃ±os del Inca. Today you drive along a scenic road through the country side from Cajamarca to Leymebamba. -	All journeys over land with private transportation, incl. from Chachapoyas.